【Universal Compatibility】- Well Compatible with PlayStation 4 , New Xbox One , Nintendo Switch , PC , Nintendo 3DS , Laptop , PSP , Tablet , iPad , Computer , Mobile Phone . 【HD Crystal Stereo Surround & Noise Cancelling】- Perfectly reducing background noise by all-inclusive PU leather earmuffs to enjoy each 3D loud explosion and any cautious footstep of an enemy. 【Easy Operation & Flexible Microphone】- Simply controlling the button of Mute and the flexible mic of the headset at any time without disturbing your gaming. 【Comfortable Humanized Design for Wearing】- Ingeniously design can reduce hearing impairment and heat sweat for long time gaming owing to superior comfortable memory foam and good air permeability over-ear adjustable pads. 【RELIABLE 12-MONTH WARRANTY】- We attach great importance to product quality and customer experience and will offer you a 12-month warranty. Please feel free to contact us if you have any problem about the product. Love this headset. The microphone is clear, they are comfortable to wear fits great over my ears, great sound, clear speakers and great headset for online gaming. This headset is a great buy. Great colors like blue and red. Very clear microphone and great fit over ears to help keep outside noise down and to hear very clearly, I like that they will fit my game system and my i pad and the sound OMG is wonderful and clear. I like the volume control being easy to reach too. The only thing I would like better is if they were cordless. Other than that I love this headset. If the head set was cordless that would be great. More colors would be a great option like white, purple, green and orange. 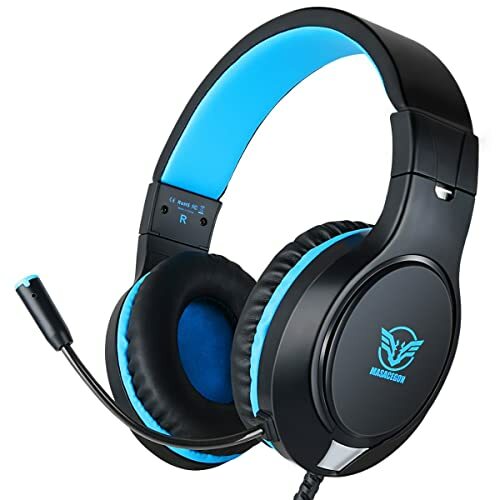 If you are a person who plays video games online, watches videos on i-pad, plays electric instruments like guitar or piano or need a head set for your computer to talk online to others this head set is defiantly for you Overall I really like this headset. The clearness and comfort is the most important to me. I like that you can plug it into most electronic devices. The Gaming Headset for Xbox One, PS4,Nintendo Switch, Bass Surround and Noise Cancelling is a great way to keep being on the game. The gaming headset it is very comfortable it adapts to your head. The headset covers the whole ear so that any noise from any surroundings won't distract anyone from hearing. The microphone is the right size that permits maximal and clear voice plus it has an on and off button. The headset is very lightweight and does not makes the head hurt. I would suggest a volume adjusters next to the on and off mic. The cord could be a little smaller on thickness. this product is for kids, teens and adults that like to play video games on any entertaining system. In conclusion the gaming head set is a good way to become a pro in gaming. Its size and weight makes it ideal to wear it long periods of time, and the sound is very good as the mic is very sharp to communicate. Gaming headset for PC and Xboxone For the price, it is awesom. The sound is great for a gaming headset and has good bass. The mic quality is not bad, just acceptable. The headset itself is a little bit bulky looking, but that’s just my feeling. They work really well. They don’t cut out, they have good quality sound, and it immerses you into the game. Awesome, Awesome, AWESOME Headphones! Pros: These headphones offer a really affordable price point, so I was naturally wary that they would work well at all. I was proven wrong for sure. These headphones are awesome! They offer a balanced range of sound, including a good deal of bass when needed. Also, the padding on the ears offers ample comfort and blocks out most exterior noises. While volume was on fully, I could hear heavy muffled conversation from my loud friends, but only slightly. Honestly, very impressed with the product and could compared to those in the $100 price range. Cons: The top piece that goes over the head is slightly heavier than I normally like for headphones, but this isn't a breaking point for the use of the product by any means. I would suggest thinning or making the top headband piece if anything. Also, the back of the box has Nintendo Switch spelled wrongly (says Swith instead of Switch). Hey,come to try Gaming Headset for Xbox One, PS4,Nintendo Switch, Bass Surround and Noise Cancelling with Flexible Mic, 3.5mm Wired Adjustable Soft Over-Ear Headphones for Laptop PC Mac iPad Smartphones now.It's a trial rebates.